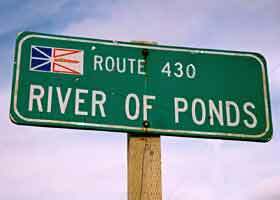 This adjunct to the Alaska Roads site presents some road photos from my August 2003 road trip to some other cool northern places on the other side of the continent, Newfoundland and the other Maritime Provinces of Canada (plus a few bonus photos from Maine). 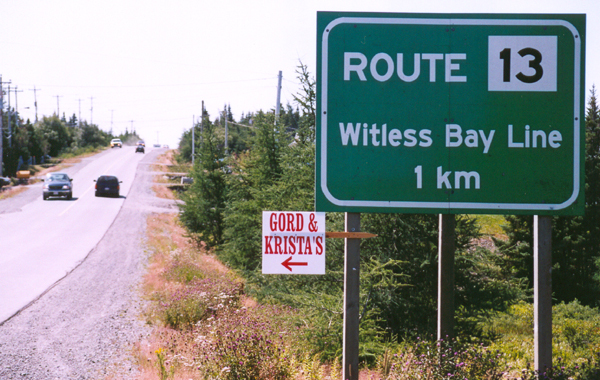 I spent six days in Newfoundland, traveling to most parts of Newfoundland island, including a stop at the easternmost point in North America (but deferring to a later trip the mainland Labrador region of the province). I also spent a few days in Nova Scotia to and from Newfoundland, and took a very brief side trip to Prince Edward Island (mainly to travel the Confederation Bridge, which was built after my prior visit to that province about fifteen years ago), in addition to blowing through New Brunswick on my way out of and back into the United States. This photo collection is divided into three pages. The photos below cover road signs and pavement markings. 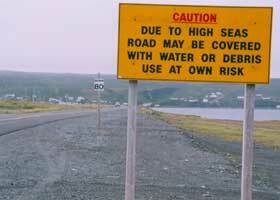 Page 2 covers other sights along Newfoundland highways, plus licence plates. 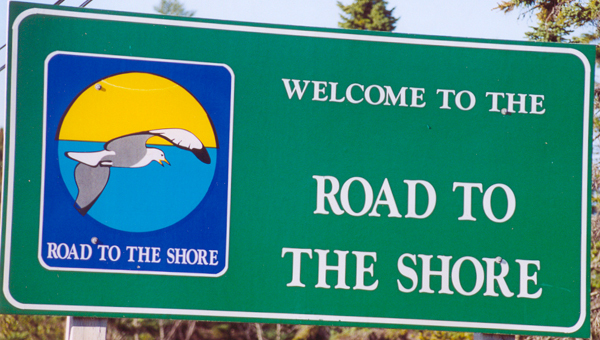 Page 3 covers the other Maritime Provinces, as well as a little bit of northern Maine. 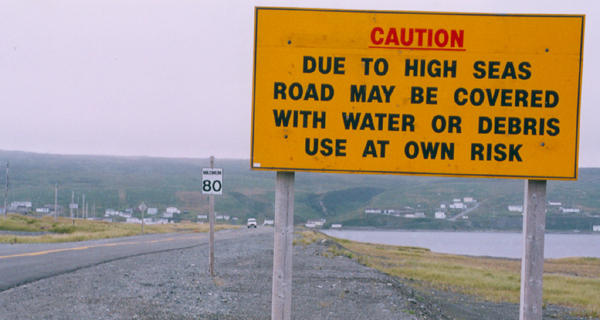 I also came back from my road trip with some road-related souvenirs from Newfoundland and elsewhere in the Maritimes, which are displayed on a separate site. NOTES: If you want to see a more detailed version of one of the photos below, click it to view an enlarged, higher-quality (less .jpg compression) version, if one is available. Those alternate versions have much larger file sizes, so please be patient while they download. 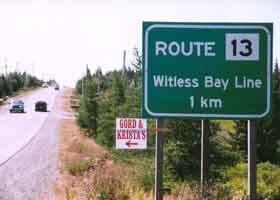 Note: The intersecting road is called a "line," a term often used in Newfoundland. "Lines" are inter-community roads, much longer than "lanes." 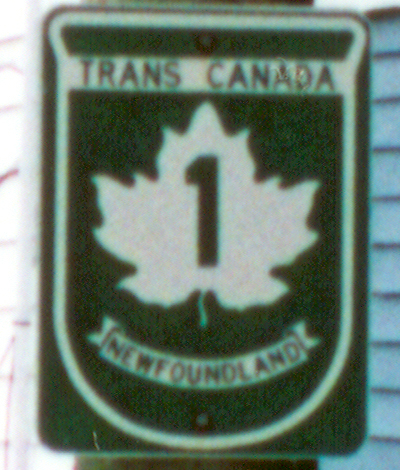 This sign reflects the standard route marker style now used in Newfoundland for regular provincial routes -- black number inside a plain white square, on a big green rectangular roadside sign. 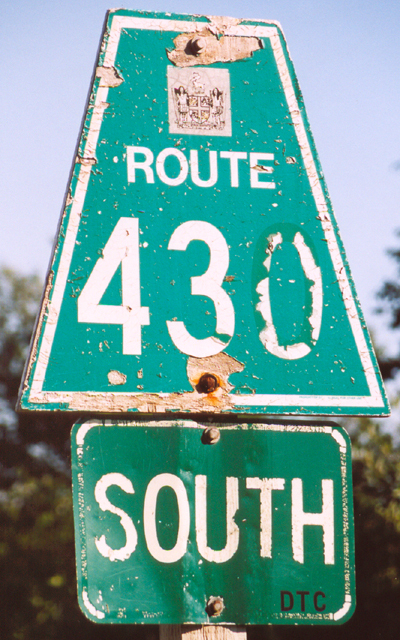 The route number indicates that the route is not a primary route (otherwise its number would end in "0"), but rather a branch from primary route 10. 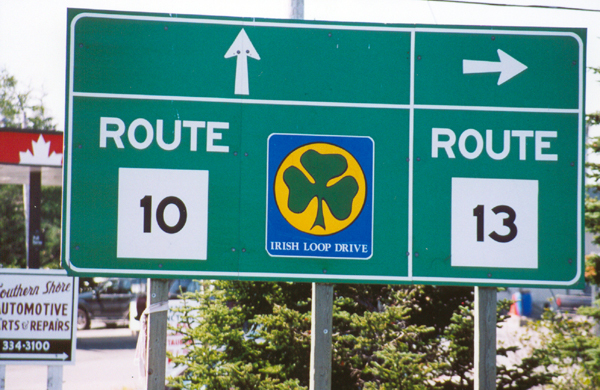 One- or two-digit routes (except Trans-Canada Highway 1), and three-digit routes beginning with "1," are all in the Avalon region in the southeastern corner of Newfoundland island. 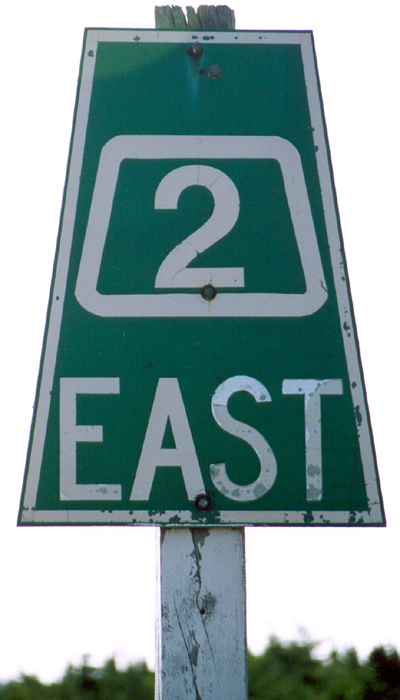 Three-digit routes begining with "2" are in the eastern region northwest of the Avalon region; first digit "3" is reserved for the central region around Gander; "4" is for the westernmost parts of Newfoundland island; and "5" is for routes in Labrador. 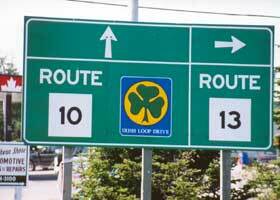 Here is an older cutout-style provincial route marker. 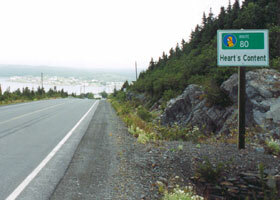 This example is from the Pitts Memorial Drive freeway connecting the TCH to downtown St. John's. 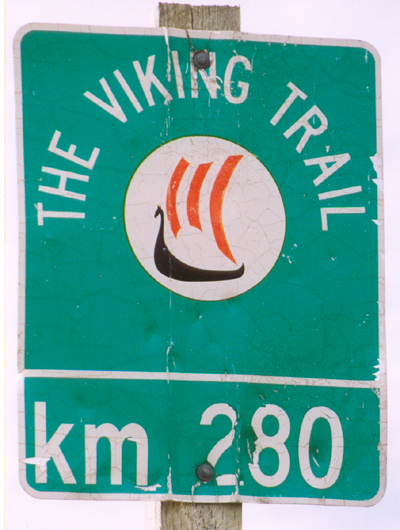 I found this really old route marker on the Viking Trail, connecting the TCH in Deer Lake to the old Viking settlements on the northern tip of Newfoundland island. 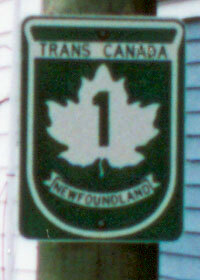 The Trans-Canada Highway in Newfoundland, crossing the province from Channel-Port-aux Basques in the west (where ferries make the connection to the TCH in Nova Scotia) to provincial capital St. John's in the southeast, gets route number 1 in Newfoundland and the province's version of the standard TCH route marker. 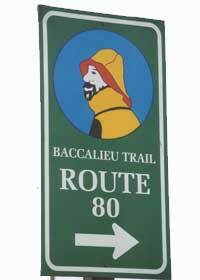 This photo was taken in the Signal Hill district of St. John's, which used to be the east end of the TCH and still has some of the old route markers (see page 2 for the TCH's new east end). 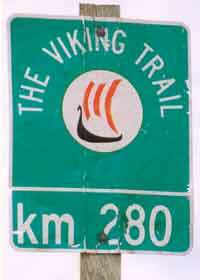 Many major routes, or multiple routes forming loops (or sometimes main routes together with their spur routes), are given names and marked with colourful route name markers to supplement the standard route number markers. 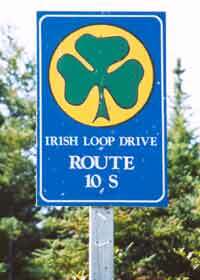 Many of these route name markers include the route number, and often (as with the Irish Loop marker above) indicating the direction of travel along with the route number. The only Road to the Shore photo I took is from central Newfoundland, on route 320 just east of the exit from the Trans-Canada Highway at Gambo. 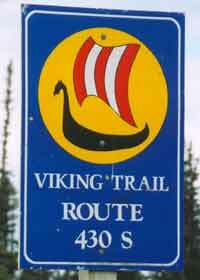 The Viking Trail has both a current-style route name marker (above left, on southbound route 430), and an older style (above right), both using a Viking longboat as the highway's symbol. 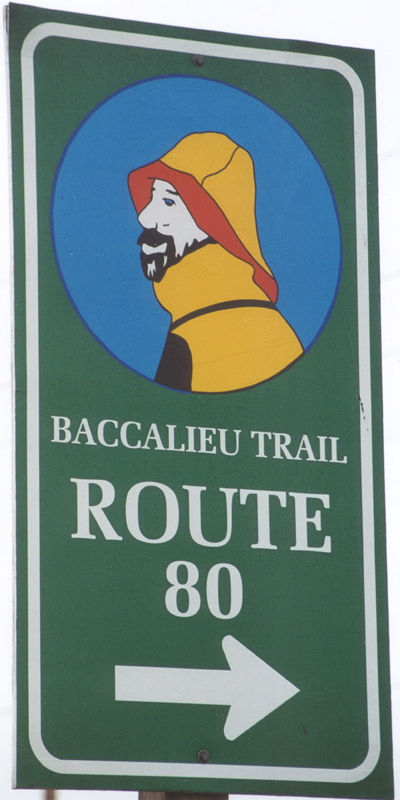 The older-style trail markers appear every 30-40 km or so, indicating the distance from Deer Lake, and include the only thing resembling a km-marker on any of the highways I traveled in Newfoundland (by contrast, the other Maritime Provinces have km-markers at least on the TCH and other major routes). 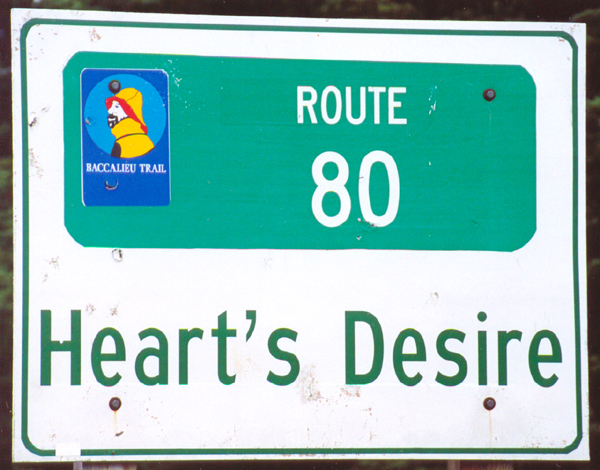 These signs show, along with the route name and number, the names of the communities coming up on the highway, here on northbound route 80 (part of the Baccalieu Trail) approaching Heart's Desire, followed by the larger, adjacent Heart's Content. 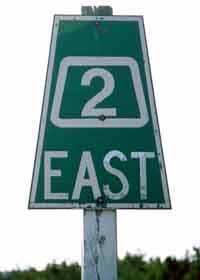 This appears to be the current sign style, at least on named routes. 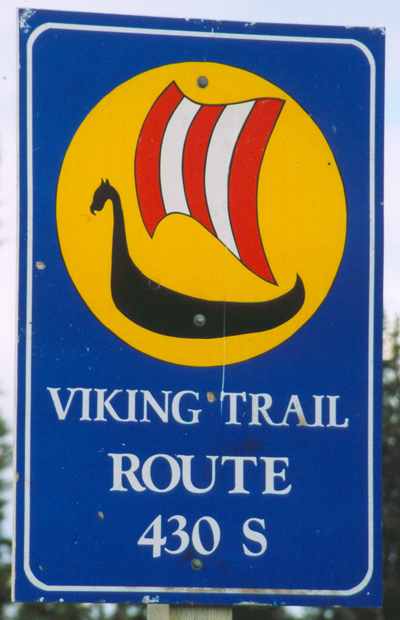 This style of village marker, on the Viking Trail (route 430) approaching River of Ponds, uses the provincial flag instead of the trail marker. 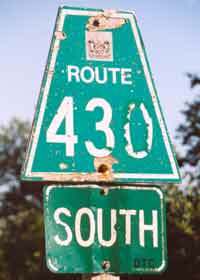 This appears to be an older style, though it may still be routinely used on unnamed highways. This kind of sign is typically used at highway junctions. 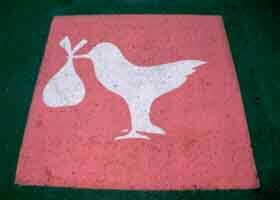 This pavement marking reserves a prime parking space for new and expectant mothers, in a shopping centre off route 60, northwest of St. John's near Conception Bay South. 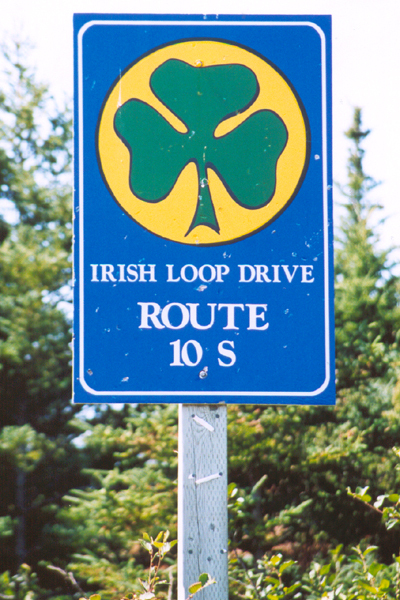 This low-lying stretch of the Irish Loop (route 10 on the south shore of the Avalon Peninsula, between St. Peter's and S. Vincent's, near where route 10 meets route 90 for the other half of the loop) sometimes is closed by waves washing over the berm to the left. Fortunately, there are alternate ways out from both ends of this stretch, so high seas closures don't leave local residents stranded. 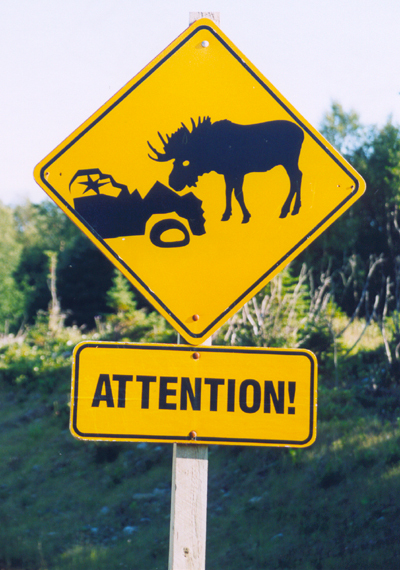 This eye-catching moose warning sign is on the Viking Trail (route 430) as it passes through Gros Morne National Park. 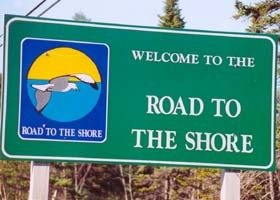 You can buy T-shirts with a copy of this sign (which I first noticed on fellow passengers on the ferry back to Nova Scotia, too late for me to buy one for myself). 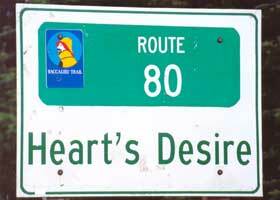 Alaska Roads main page (under construction as of October 2007, but has some useful information and links). © Oscar Voss 2003-2004, 2007.